Pumpkin, Chipotle and White Cheddar Grits with Bacon-Wrapped Shrimp is the perfect autumn treat for an easy dinner or for entertaining guests! This post is sponsored by Kroger. All opinions are mine alone. It’s pumpkin time! Just the name of this healthful gourd can put a smile on a person’s face! The flesh makes delicious desserts or left whole and carved into scary faces, it lights up the Halloween night. With a variety of health benefits such as being rich in fiber and potassium, it’s wise to work more of it into your diet. When pumpkin season rolls around, most of us think pumpkin pie, pumpkin muffins, pumpkin bars, pumpkin rolls, etc. Or, what about a delicious savory and spicy main dish? I think I’ve said it a time or two but you know I love me some shrimp and grits! When I moved to the South, I never had grits nor shrimp and grits. I could handle shrimp in any form, but I was more than a little apprehensive about grits. Then, my husband and I stayed at a Southern antebellum bed and breakfast a number of years ago and on the plate served to me for breakfast were grits. Yes, they made me a little nervous but they were creamy, cheesy and divine! I then had shrimp and grits at an area restaurant and from that point on I was hooked! 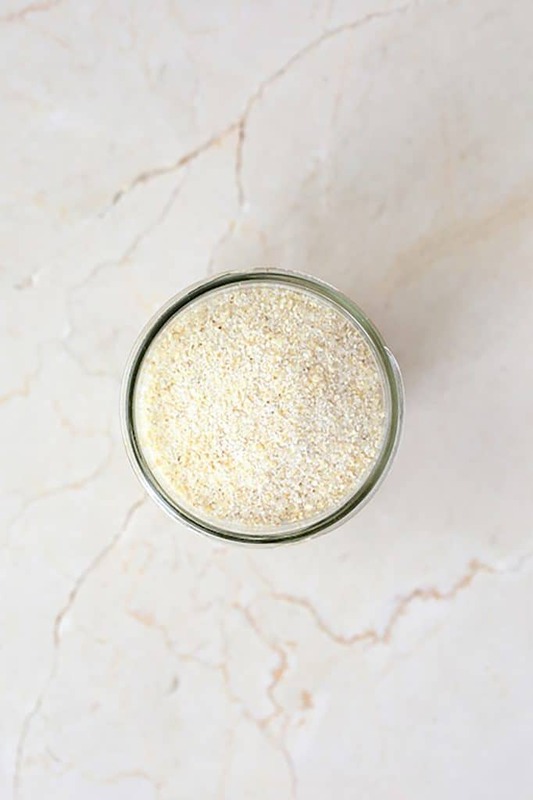 What I didn’t know about grits upon becoming hooked was there were so many different kinds! There are stone-ground (sometimes referred to as old-fashioned), instant and quick. Stone-ground will have the best texture, quick is good in a pinch and instant is when you need a grits fix but don’t have a lot time. Stone-ground is what I used here. You can find them in the breakfast cereal aisle at your local Kroger. This Southwestern-inspired Pumpkin, Chipotle and White Cheddar Grits with Bacon-Wrapped Shrimp are all my favorite things in life! Pumpkin, spicy and smoky chipotle peppers, cheese, shrimp and BACON! Kroger has a fantastic line of products called “Simple Truth.” With Simple Truth products, Kroger is making organic and wholesome easier and more affordable. 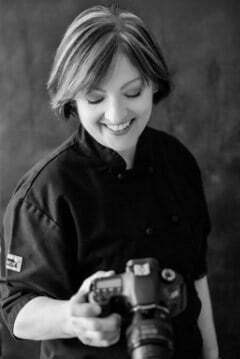 Whenever I purchase Simple Truth products for my personal chef clients or for myself, I know I’m getting a good, clean product. 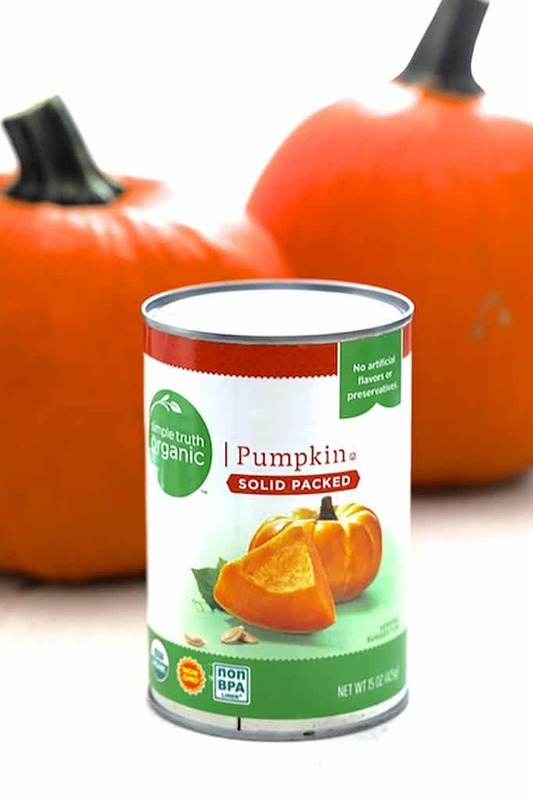 For example, the ingredients label of Simple Truth canned pumpkin just says “Pumpkin.” How awesome is that? And it’s organic! Even better. All of the ingredients in this dish are available at Kroger and most are from their Simple Truth line. Now onto this dish! 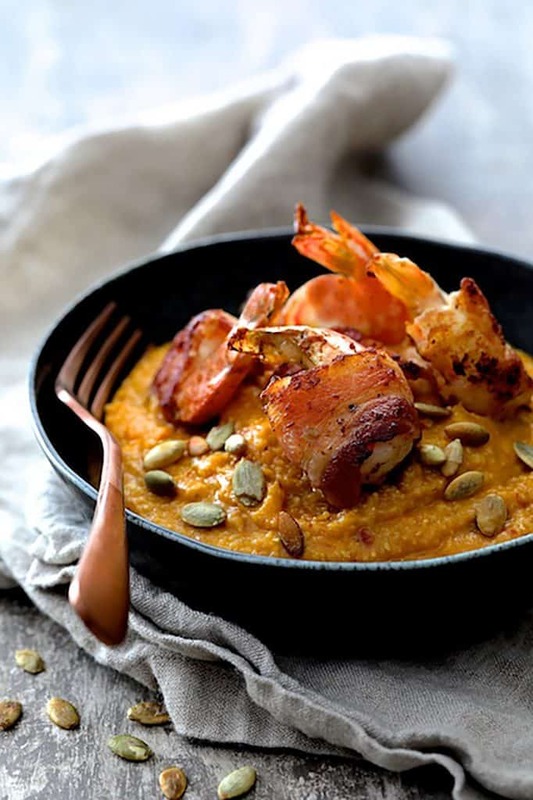 Pumpkin, Chipotle and White Cheddar Grits with Bacon-Wrapped Shrimp is easy and impressive. When cooking the grits, get the water or broth boiling. Then, add the grits gradually. If you add them all at once, they have a tendency to lump up. While the grits are simmering away, wrap some colossal shrimp with half-slices of bacon and secure with toothpicks. If you’re nervous about overcooking the shrimp, you can parcook the bacon a little bit. Simply get some of the fat rendered off but don’t let it get it crispy. Then, finish as directed. Then brown well on all sides in a nonstick skillet. Serve the bacon-wrapped shrimp over the spicy pumpkin and cheese grits, garnish with toasted pumpkin seeds and… Friends! Pumpkin, Chipotle and White Cheddar Grits with Bacon-Wrapped Shrimp is a crazy delicious autumn dinner that’s perfect for a great meal at home or for entertaining guests! 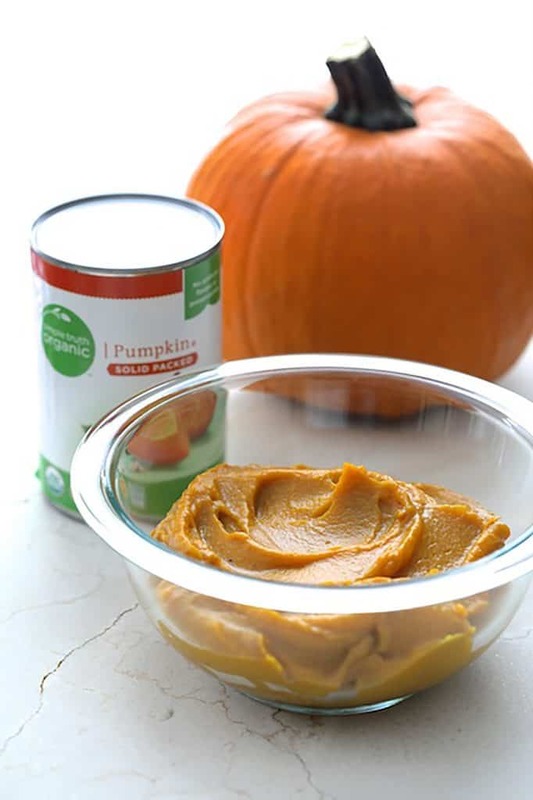 This dish uses only one cup of a whole can of Simple Truth pumpkin. Don’t discard the remainder! 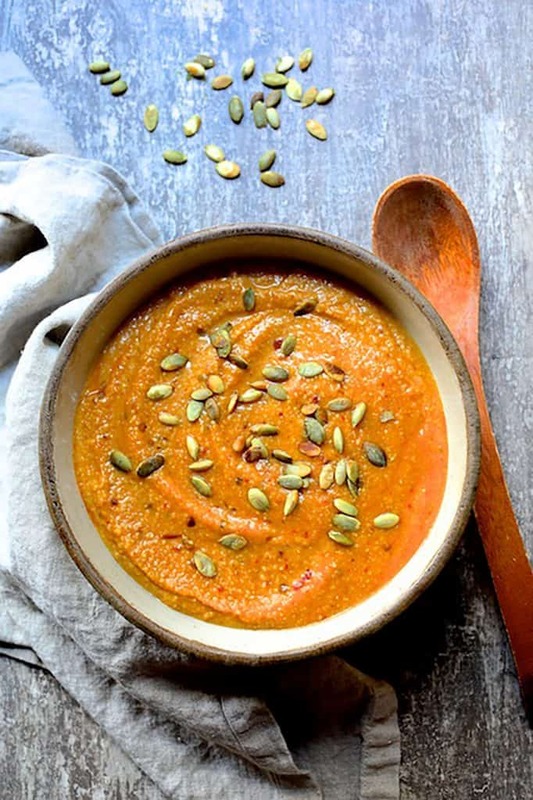 Save it to add pumpkin goodness and flavor to soups and stews this fall and winter! 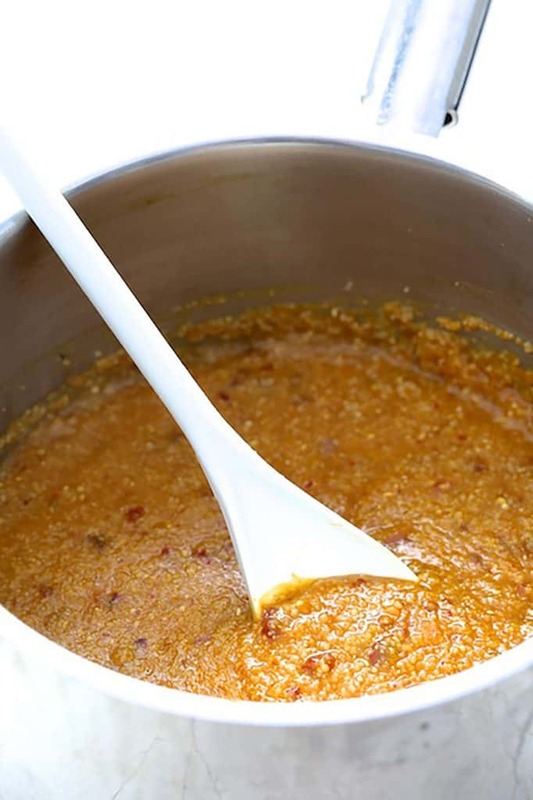 GRITS: Bring water or chicken broth, pumpkin, chiles, salt and black pepper to a boil. Slowly add the grits in a constant stream, stirring constantly. Reduce heat to medium-low and cook, stirring often, 15-20 minutes, or until thickened. Stir in butter and cheese, cover and let stand while browning the shrimp. SHRIMP AND GARNISH: Toast the pumpkin seeds in a nonstick skillet 3-5 minutes or until lightly browned in places, beginning to pop and you notice a toasted aroma. Transfer to a plate. 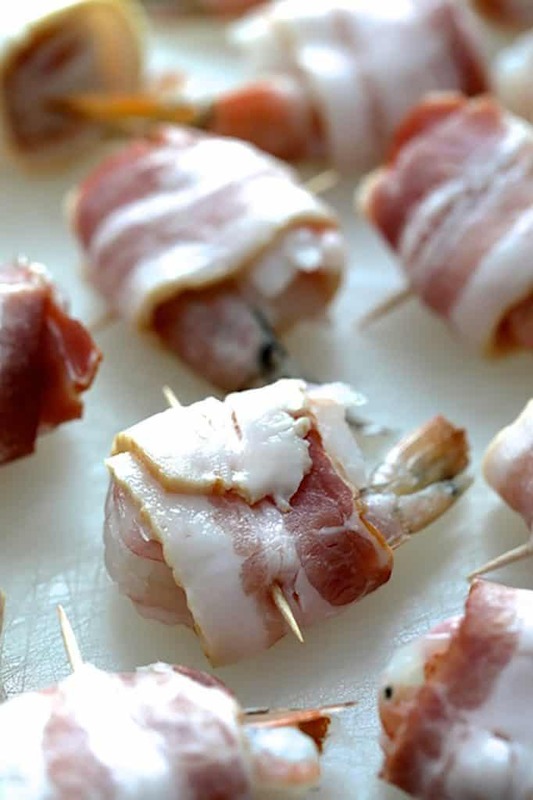 Wrap each shrimp in half a slice of bacon and secure with a toothpick. Place the shrimp in the nonstick skillet you used for the seeds and cook, turning frequently until the bacon is nicely browned on all sides and the shrimp is cooked through. Serve the shrimp over the grits. Garnish with toasted pumpkin seeds. If you're nervous about overcooking the shrimp, you can parcook the bacon a little bit and then wrap the shrimp and finish cooking it. I love shrimp and grits and you had me at bacon, but with pumpkin and a little heat too? I’m in heaven. Well, you had me with the bacon wrapped shrimp but love the idea of adding pumpkin to the grits to make a perfect fall recipe!! I bet it’s amazing! As a girl born in the South, I am a *huge* grits fan. I’ve never had a Fall version or one with pumpkin, and this one sounds amazing! I’ll definitely be trying out the recipe to see what I’ve been missing! 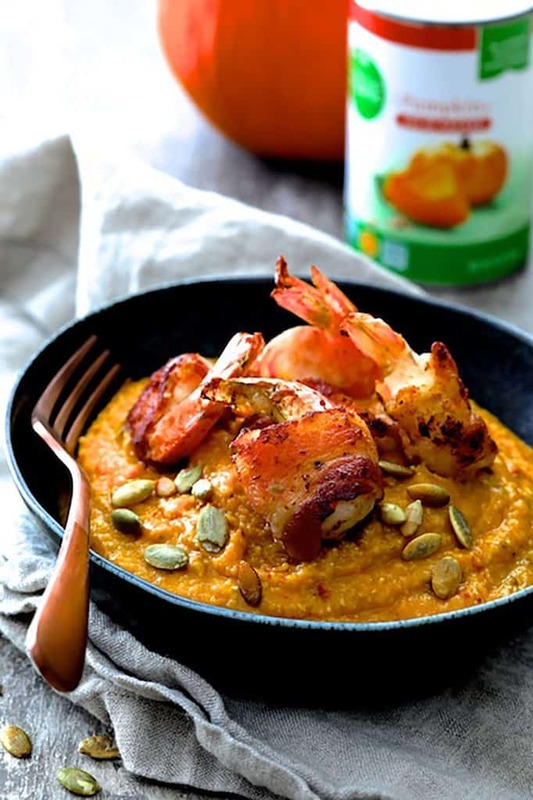 This looks to be an exciting recipe since it has shrimp and pumpkin too. Never tried this combo but sounds so yumm. You had me at shrimp and grits! What a yummy way to serve it. Looks like I might need to give this a try especially since my kitchen is overflowing with pumpkin puree. WOW! This looks absolutely amazing!! I will have to try this – thank you for sharing!! 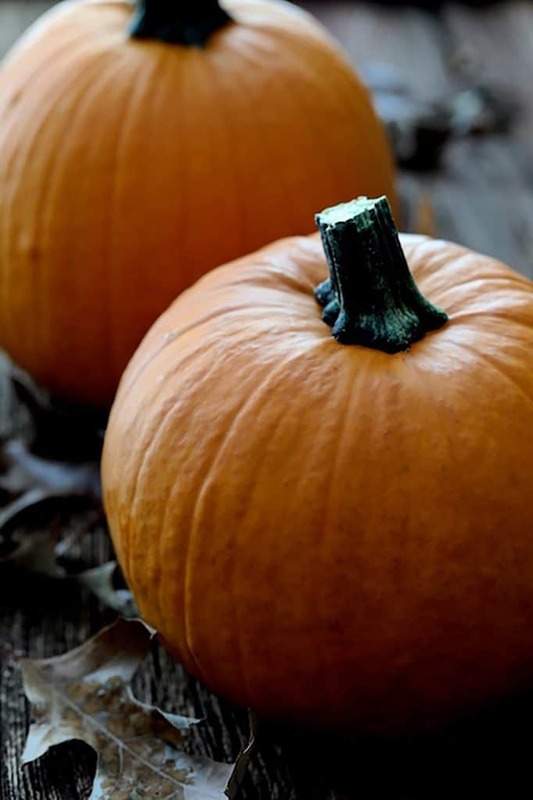 Finally a pumpkin recipe that is in a delicious meal as opposed to a dessert. This looks and sounds amazing and I am adding this to my meal plan for this week. Simply awesome! I am salivating!! But I have to admit that I lived on polenta ( a poor man’s dish) long before it became popular fare. I do like grits or polenta any time of day and to think I used to complain about it when I was young. Silly me!! 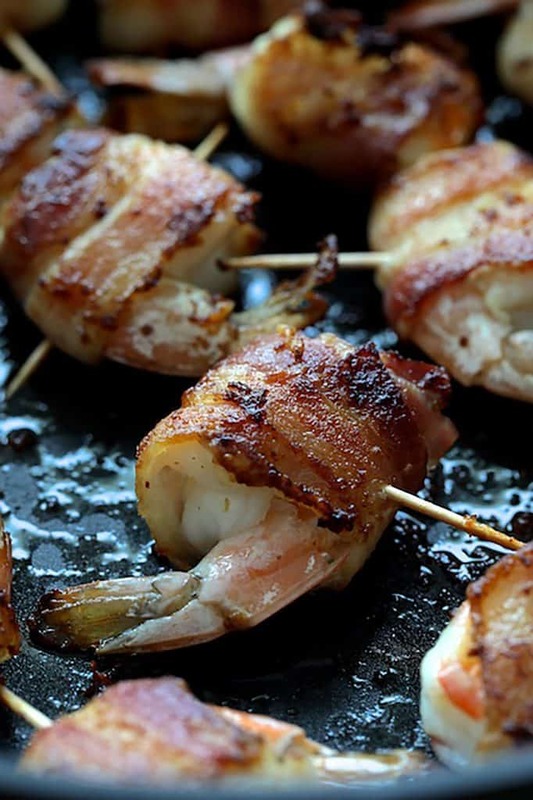 Do you have a hard time getting the bacon crispy without overcooking the shrimp? The dish looks wonderful!! I’m a big believer in using wild-caught shrimp; it’s so much more “durable” than farm-raised. For this dish, be sure to use “colossal,” which is generally 10-12 count per pound. If you’re unsure, you can always parcook the bacon a little bit. Thanks so much about bringing that up! I put a note in the recipe about that. Shrimp and grits is one of my all-time favorite meals but I live in the north and it’s pretty hard to find. I’ll definitely have to try this out. Love the addition of the chipotle pumpkin! Wow. Really love this version of grits. I’m sure the addition of chipotle also makes it yummy. Thanks for sharing a savory pumpkin recipe amidst all these pumpkin recipes. Shrimp and cheese grits are the best in Southern comfort food. I’ve never thought of adding pumpkin and chipotle. That sounds so good! Love this idea. Now I’m hungry. There are a lot of sweet pumpkin recipes out there right now, so I appreciate that this one is savory! Looks SO delicious. Hope to try it soon! I love grits, and adding pumpkin to them just makes me super excited to make this … I love twists on classic ingredients!